My name is Alyda , I am 21 years old. I've been taking care of kids since very little. My grandmother had 14 kids so you can imagine taking care of my cousins, nieces, & nephews. 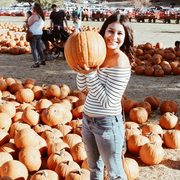 I live in Valley Center & I use to work at Bates Nut Farm, a pumpkin patch. I speak English and Spanish fluently. I am non-smoker as well as have a clean driving record. I am also a dog owner so I would definitely not mind being around dogs. I’d be happy to provide references as well as meet or chat on the phone. Looking forward to hearing from you and I wish you the best of luck with your search! Alyda was awesome with our 1.5-year-old while we were visiting Oceanside from Colorado. She made him feel comfortable right away and even brought a kit of fun stuff for him to play with. She was on time, confident with our kiddo, and all-around charming. We highly recommend her and will definitely use her again when we find ourselves back in Oceanside!